Following the success of last year’s Mystery Shopping programme we are delighted to confirm that our awards scheme is back for a second year. 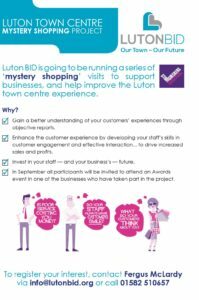 Our Mystery Shopping scheme is designed to identify, enhance and recognise customer service excellence in Luton town centre. Please sign up to take part (lots of you already have) by emailing info@lutonbid.org by 5pm on Friday 31st May. You will then be visited by a mystery shopper this summer and invited to a prestigious awards event, which will take place in September. For information and details click here: Mystery Shopping 2019.